I got forwarded two different items from two different third parties, including an invitation and the agenda for the Gates-funded NYC Ed Reform retrospective conference next week (see below for the agenda). The only NYC public school parents who are allowed to attend this invitation-only event are the five borough appointees on the Panel for Education Policy, originally with the excuse that there was no room for any others. For more on this, see our blog here. Yet they have now extended the RSVP date several times, and also the invitations to a wider group as too few on the original list of invitees apparently signed up. They are also apparently inviting some reporters but excluding others. 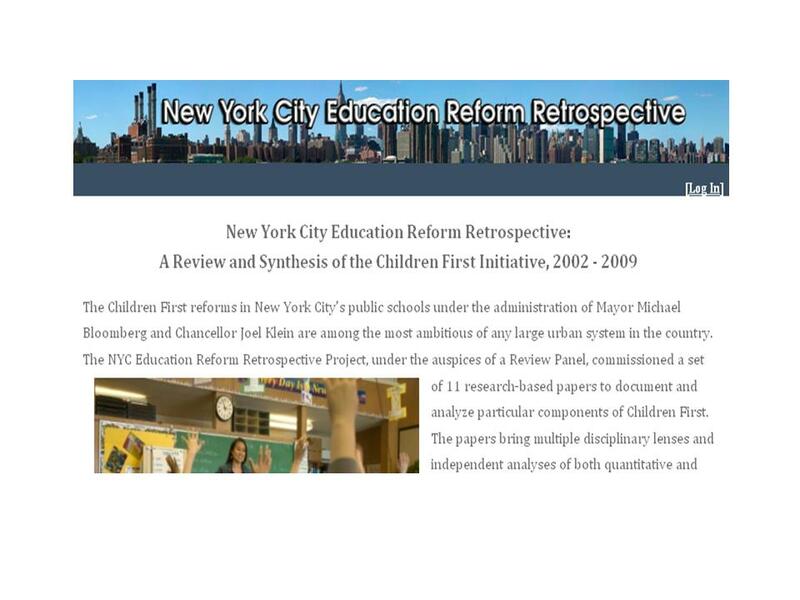 I especially like the title of one of the papers: "Improving Instruction in NYC Schools: An Evolving Strategy." That's certainly one way to put it! What parent and community engagement? Parent and community engagement has been consistently discouraged by this administration from the beginning, so I don’t see how there’s anything to sustain. Even DOE's office of family engagement has now taken out the word "engagement" out of its title, in recognition of this fact. James Kemple, will be presenting a paper on student outcomes. Kemple was chosen as the head of the much-ballyhooed “Research Alliance” (originally called the Research Partnership) in October 2008 , which is supposed to be a repository for student data that could be made available to independent researchers. The Alliance was also supposed to produce its own reports, but as far as I know this paper will be the very first released since Kemple was appointed – more than two years ago. Meanwhile, though this event is happening on Nov. 10, the papers won't be made available to the public until Nov. 15 -- according to its website. Due to space limitations, please attend the session you registered for. I feel sorry for Patrick if he has to sit through this. That's a good schedule for the students. I think I may study again for my own benefits.